Lee Stetson brilliantly portrays John Muir, America’s foremost naturalist and conservationist! Audiences around the world are bringing the spirit of Muir into their communities, with a little help from actor – and Muir scholar – Lee Stetson. 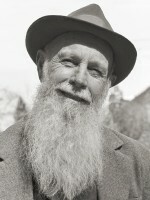 Lee’s portrayal of John Muir has been presented in Yosemite National Park since 1983, to hundreds of thousands of visitors. Additionally, his Muir presentations have toured worldwide to universities, parks, museums, wilderness and environmental organizations from Washington D.C. to Hawaii, from Japan to Scotland. Lee offers six live performances based on Muir’s life, philosophy and amazing wilderness adventures. He also offers personalized performances and lectures tailored for your event, including A Stroll with John Muir, Customized Shows & Story-telling and Lectures on the Performing Arts & Environment. See Show Descriptions and Book A Show for more details. Learn more about Lee and the performers he works with. Join John Muir (Lee Stetson) as he retraces his exciting journeys to Southeast Alaska, sailing on the elegant Wilderness Discoverer for 14 nights from Seattle to Juneau, highlighting Glacier Bay National Park and Preserve. The S.S. Wilderness Discoverer carries only 76 happy guests, providing an intimate, friendly and comfortable exploration of Alaska. She’s capable of nimble sailing into far reaches of the Alaskan wilderness, and is equipped with kayaks, paddle boards, skiffs and a portable activity launch platform for added explorations, providing for close up encounters with whales and wildlife, and has every agreeable amenity. Mr. Muir has exciting NEW adventures to relate, and UnCruise’s talented expedition team will provide many educational presentations as well.